King’s College London was established by King George IV in 1829 and became one of the founding colleges of the University of London. It is now a multi-faculty institution with some 17,160 students occupying a leading position in higher education in the UK and enjoying a world-wide reputation for teaching and research. King’s was established next to Somerset House on land granted in perpetuity by the Crown, and this Strand campus is still the College’s main site, in the heart of London, close to the seat of Government, the City, the Royal Courts of Justice and the Inns of Court. 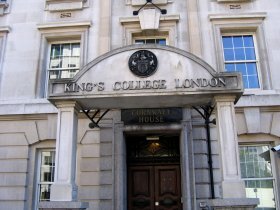 King’s was founded in 1829 with Crown, Church of England and political support amid popular opposition to the foundation of humanist University College London on Gower Street. Indeed a duel  was fought over the College’s honour between the then-Prime Minister, the Duke of Wellington, and the Earl of Winchilsea who questioned the Prime Minister’s support for Catholic and Anglican institutions, but nobody was injured. Rivalry between the two colleges continues today: UCL often claims superiority over King’s through its slightly higher rankings in university league tables, but King’s is widely supposed to be the more famous of the two colleges. Both federated into the nascent University of London when it was established by charter in 1836. In addition to the founding of the College in 1829, King’s College School was created as the Junior Department. The School’s premises were in the basement of the King’s College site east of Somerset House, but later moved to its current site in Wimbledon in 1897. The first qualification that King’s issued was the Associate of King’s College or the AKC. This is still awarded today to students and staff who take an optional two to three year course through the Dean’s Office. In August 2005 the The Guardian newspaper stated that London School of Economics, Imperial College London, King’s and University College London individually have international reputations that in this country only Oxbridge can beat. The Guardian also ranked King’s as the sixth best university in the country. According to these 2005 results, King’s is the best non-Oxbridge multi-faculty university in England. Many of its departments also came top in their field. Most notably, the English department was ranked as the best in the country beating those of both Oxford University and Cambridge University. King’s is a member of the self proclaimed elite Russell Group of leading research universities and is consistently ranked as one of the top 20 universities in Europe, and is highly distinguished for Humanities (especially Classics, Music, English and History), Law, War Studies, Medicine and Dentistry. It has the fifth largest endowment of UK universities at £100m (2002), the fourth largest endowment per student, and has credit ratings of AA-/Stable/A-1 (Standard & Poor’s). Florence Nightingale’s original training school for nurses was at St Thomas’ Hospital and King’s College Hospital and is now incorporated into the university as the Florence Nightingale School of Nursing and Midwifery. Perhaps the most famous scholarly research performed at King’s was the work by Rosalind Franklin and Maurice Wilkins that was essential to the discovery by James D. Watson and Francis Crick of the structure of DNA. King’s is also known for its top ranked War Studies department that attracts students with both a civilian and military background across the world looking for high quality degree programs. It is supported by facilities such as the Liddell Hart Centre for Military Archives and the King’s Centre for Military Health. In September 2005 an innovative e-learning MA/Diploma will be launched – War in the Modern World. This postgraduate course will be delivered purely online for students around the world. The current Principal is Professor Rick Trainor, formerly Vice-Chancellor of University of Greenwich. BTW IM SMART BUT NOT BORING, LIKE THESE GOONS THAT HAVE BEEN COMMENTING THUS FAR!! Dear sir, I beg most respectfully to state that. I am a student from Bangladesh. I want to admitted in ur collge. If u interested please inform me into this email address. I m eagerly waiting for ur reply.